New research led by scientists from the University of Bristol and Queen Mary University of London has revealed that bumblebees can tell flowers apart by patterns of scent. Flowers have lots of different patterns on their surfaces that help to guide bees and other pollinators towards the flower's nectar, speeding up pollination. These patterns include visual signals like lines pointing to the centre of the flower, or colour differences. Flowers are also known to have different patterns of scent across their surface, and so a visiting bee might find that the centre of the flower smells differently to the edge of the petals. 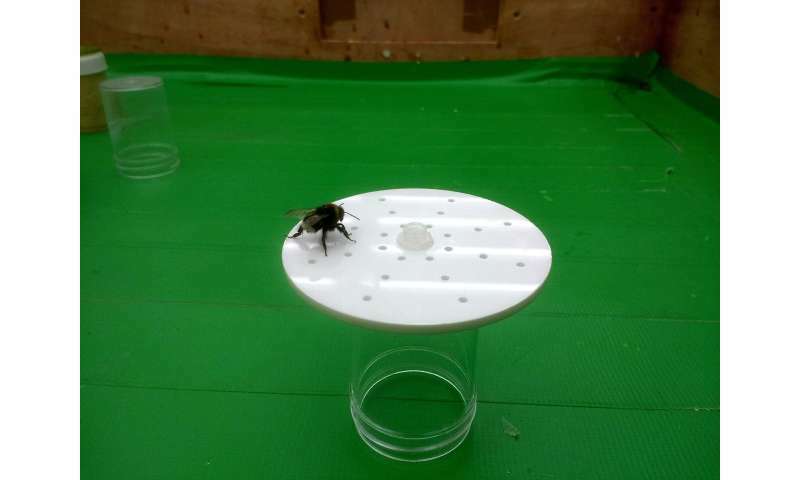 This new research, published today in the journal Proceedings of the Royal Society B shows that bumblebees can tell flowers apart by how scent is arranged on their surface. Lead author Dr. Dave Lawson, from the University of Bristol's School of Biological Sciences, said: "If you look at a flower with a microscope, you can often see that the cells that produce the flower's scent are arranged in patterns. "By creating artificial flowers that have identical scents arranged in different patterns, we are able to show that this patterning might be a signal to a bee. For a flower, it's not just smelling nice that's important, but also where you put the scent in the first place." The study also shows that once bees had learnt how a pattern of scent was arranged on a flower, they then preferred to visit unscented flowers that had a similar arrangement of visual spots on their surface. Dr. Lawson added: "This is the equivalent of a human putting her hand in a bag to feel the shape of a novel object which she can't see, and then picking out a picture of that object. Being able to mentally switch between different senses is something we take for granted, but it's exciting that a small animal like a bee is also able to do something this abstract." Professor Lars Chittka, from Queen Mary's School of Biological and Chemical Sciences, said: "We already knew that bees were clever, but we were really surprised by the fact that bees could learn invisible patterns on flowers—patterns that were just made of scent. "The scent glands on our flowers were either arranged in a circle or a cross, and bees had to figure out these patterns by using their feelers. But the most exciting finding was that, if these patterns are suddenly made visible by the experimenter, bees can instantly recognise the image that formerly was just an ephemeral pattern of volatiles in the air." Senior author, Dr. Sean Rands, also from Bristol, added: "Flowers often advertise to their pollinators in lots of different ways at once, using a mixture of colour, shape, texture, and enticing smells. "If bees can learn patterns using one sense (smell) and then transfer this to a different sense (vision), it makes sense that flowers advertise in lots of ways at the same time, as learning one signal will mean that the bee is primed to respond positively to different signals that they have never encountered. "Advertising agencies would be very excited if the same thing happened in humans." Around 75 percent of all food grown globally relies on flowers being pollinated by animals such as bees. The work published today is part of ongoing research at the University of Bristol that explores the many different ways in which plants communicate with their pollinators, using different innovative techniques to explore how bees perceive the flowers that they visit.